PopMinded by Hallmark plans its highest-ever level of yearly participation at the nation’s largest pop culture fan gatherings with limited quantities of products and collectibles developed exclusively for events starting next month. PopMinded will appear at Planet Comicon Kansas City scheduled April 28-30 at Bartle Hall in Kansas City, Mo. 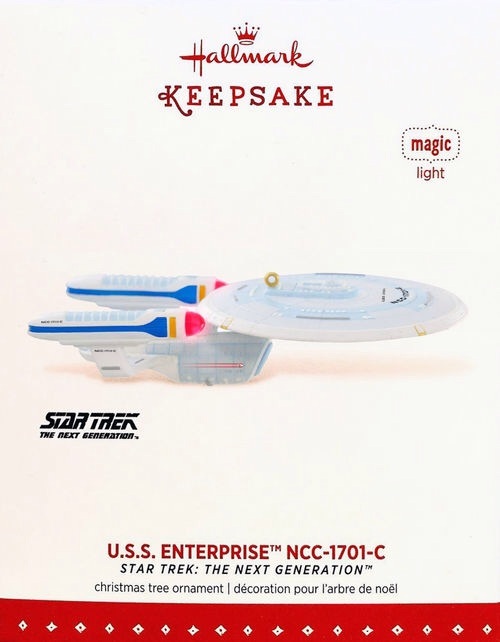 Three exclusive Hallmark Keepsake Ornament designs including the Enterprise C repaint, an itty bittys® plush, and two other gift items will be sold in limited quantities at Comic-Con International, to be held July 20-23 in San Diego, Calif.
U.S.S. 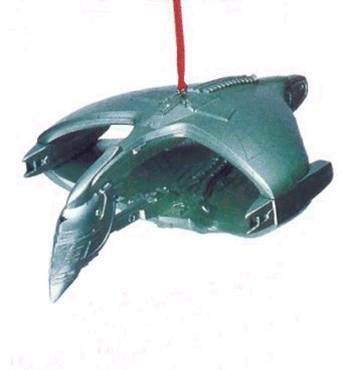 Enterprise™ NCC-1701-C, a Keepsake Ornament inspired by the Star Trek: The Next Generation episode “Yesterday’s Enterprise,” depicts the iconic starship with a battle-damage paint scheme as it appeared on screen. 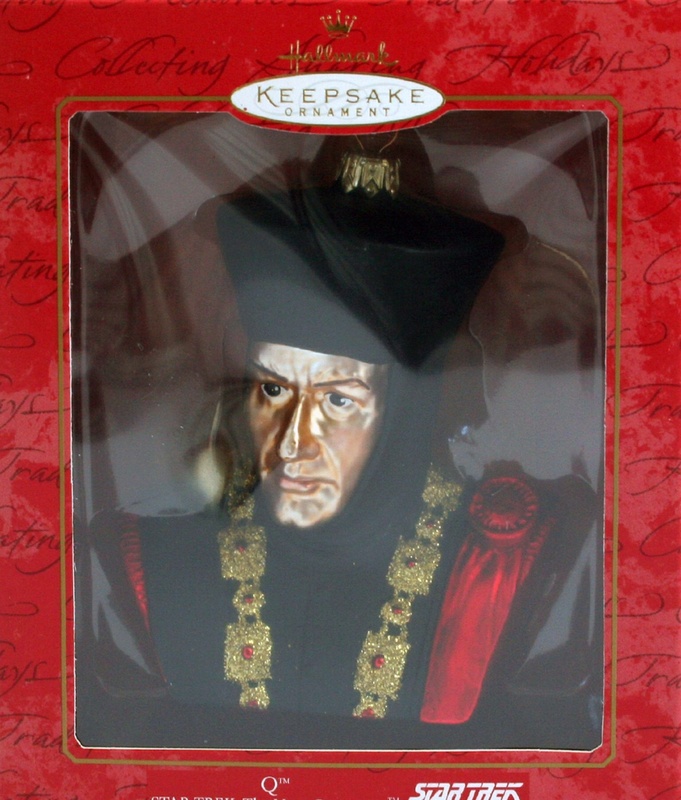 This repaint of a 2015 Keepsake Ornament has a total production run of 3,325 and sales will be limited to 225 per day. PopMinded will make its first appearance at The Official 2017 Star Trek Convention, scheduled Aug. 2-6 at the Rio Suites Hotel in Las Vegas. The repainted U.S.S. 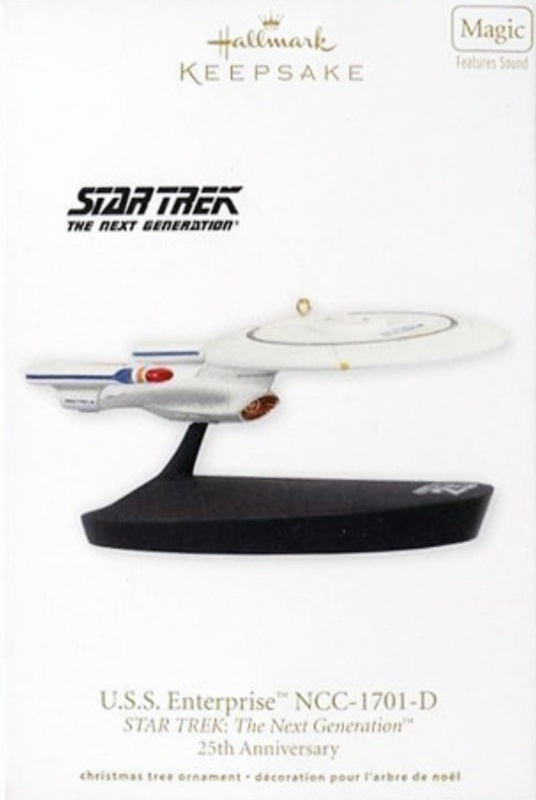 Enterprise NCC-1701-C Keepsake Ornament previously available at Comic-Con International will be sold at this event with 100 available each day. Another first for PopMinded will be Salt Lake Comic Con, scheduled Sept. 21-23 at the Salt Palace Convention Center in Salt Lake City, Utah. Products to be sold at the PopMinded booth will be announced closer to the event. At New York Comic Con, set for Oct. 5-8 at the Jacob K. Javits Center in New York City, PopMinded will offer all items previously available at Comic-Con International with the same daily allocations. Additional details about prices for each exclusive product, as well as activity plans for each event will be announced closer to the respective convention dates. This entry was posted in 084) 2017 Ent. C/Scarred, 2017, Battery, Convention News, Ent. 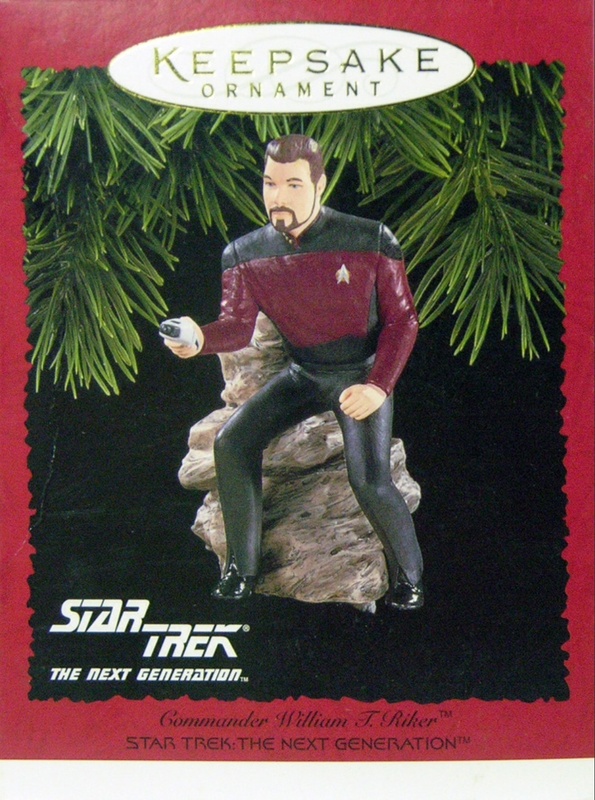 NCC-1701-C, Lynn Norton, Magic Light, Magic Series, Norton, Lynn, Ships, Special Event Editions, ST: TNG (TV) and tagged Christmas, Christmas Ornaments, Hallmark, Hallmark Ornaments, Star Trek, Star Trek Ornaments on April 3, 2017 by garfieldandtrump. The fourth Starfleet vessel to bear the name U.S.S. 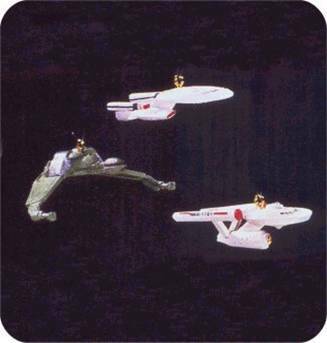 Enterprise, the NCC-1701-C played a crucial role in establishing peace between the United Federation of Planets and the rival Klingon Empire. 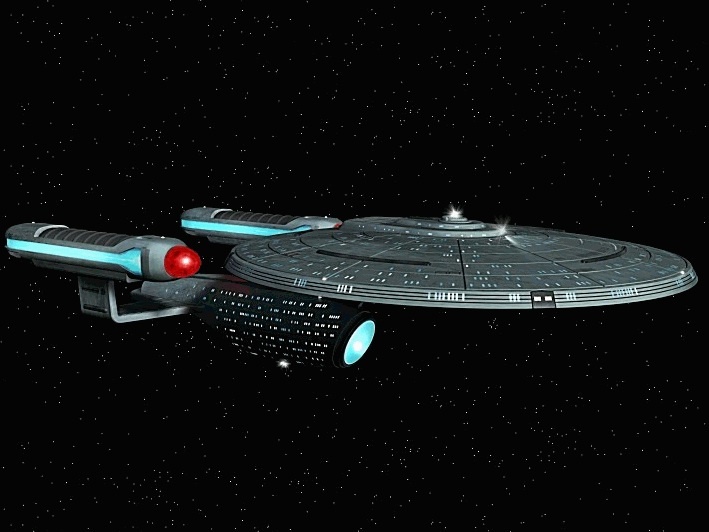 In the classic Star Trek: The Next Generation episode “Yesterday’s Enterprise” (1990), this Ambassador-class starship entered a temporal rift, providing a view of an alternate reality that transformed Captain Jean-Luc Picard and his crew into bitter and weary warriors in a decades-long conflict between the two space-traveling powers. 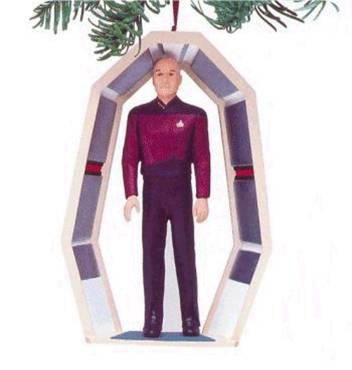 Bring a science fiction element to your tree this holiday season with this Star Trek U.S.S. 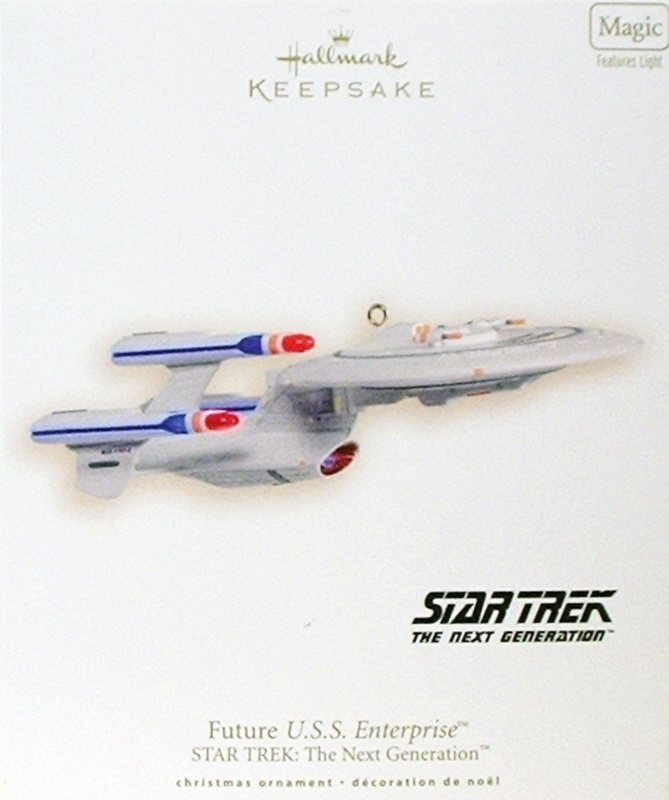 Enterprise NCC-1701-C keepsake ornament from Hallmark. Press button to illuminate lights! This entry was posted in 075) 2015 Enterprise C, 2015, Battery, Ent. 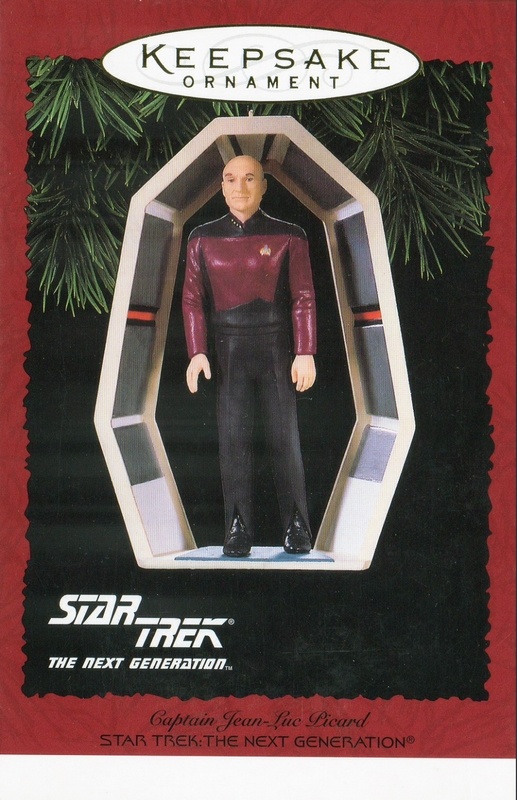 NCC-1701-C, Lynn Norton, Magic Light, Magic Series, Master List, Ornaments by Artist, Ornaments by Pwr Source, Ornaments by Ships, Ornaments by Theme, Ornaments by Year, Ships, ST: TNG (TV) on July 25, 2014 by garfieldandtrump. Inspired by Q – the powerfuland sometimes playful entity from the Q continuum who has the ability to cause chaos in hte galaxy, interupt activities aboard the U.S.S. EnterpriseNCC-1701-D, and interfere with the lives of crew members. This entry was posted in 028) 2001 “Q” (Glass), 2001, Anita Marra Rogers, Blown Glass, Master List, Q, ST: TNG (TV) on October 21, 2011 by garfieldandtrump. 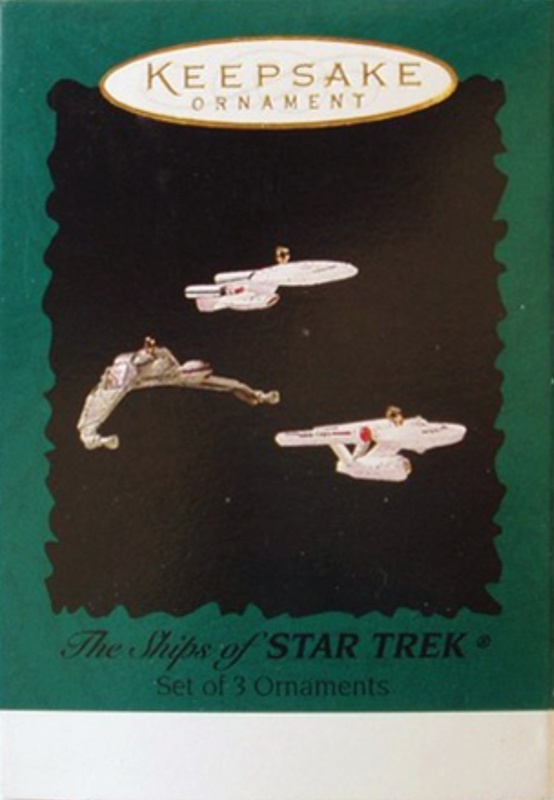 This 2000 Star Trek Hallmark ornament features the vehicle of choice for every Star Trek fan’s favorite race of atomatons – the Borg. 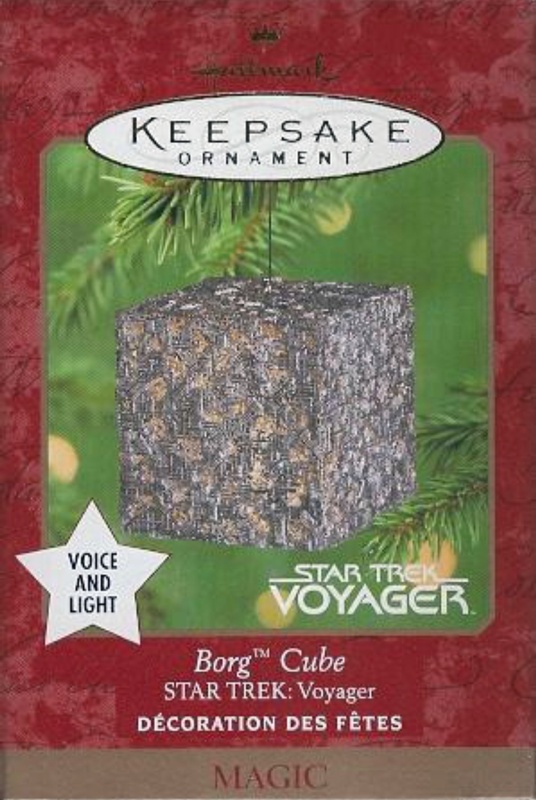 Light glows eerily and steadily from within the Borg Cube when it is plugged into a light string or Hallmark Ornament Legacy Cord. To hear “We are the Borg. Enjoy your Holidays. 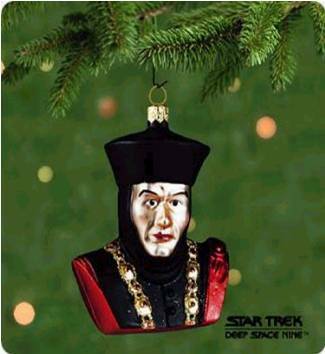 Resistance is futile.” as only the Borg can deliver it, press the button located on the side of the Borg Cube Hallmark Ornament. You can plug this ornament into any miniature light bulb socket on a miniature Christmas tree light string, or plug it into the Hallmark Legacy Cord (sold separately). This entry was posted in 022) 2000 Borg Cube, 2000, Borg Cube, Lynn Norton, Magic Voice & Light, Master List, Pigtail, Ships, ST: TNG (TV) on October 21, 2011 by garfieldandtrump. Rank: Lt. 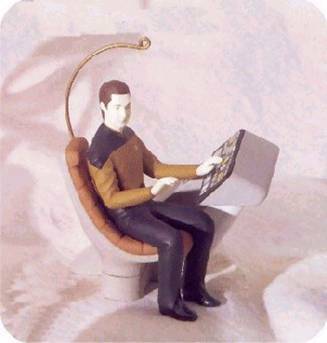 Commander of the 24th-century starship, the U.S.S. Enterprise. An android creeted by Dr. Noonen Soong, Data has been declared a “free, independent,a nd autonomous life-form” by the United Federation of Planets. his effortdto become human include acquiringa pet cat, which he named “Spot”, and trying his hand at humor (“a difficult concept”). This entry was posted in 015) 1997 Data, 1997, Characters, Data, John "Collin" Francis, Master List, ST: TNG (TV) on October 21, 2011 by garfieldandtrump. Rank: Executive Officer of the fifth Federation starship to carry the name U.S.S. Enterprise, a 24th-century strarship assigned to Deep Space exploration. Chosen to serve as “Number One” aboard the Enterpriseby Captain Jean-Lu picard, Cammander Riker (jonathan Frakes) delights in taking on challenges. he once colunteered for an assignment on a Klingon Bird-of-Prey. 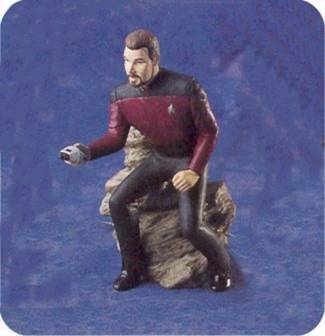 Look for Commander Riker’s counterpart, Mr. Spock, from the orignal STAR TREK television series, in the 1996 Keepsake Ornament Collection at your Hallmark retailer. This entry was posted in 011) 1996 Riker, 1996, Characters, Master List, Riker, ST: TNG (TV) on October 20, 2011 by garfieldandtrump. Rank: Captain of teh fifth Federation starship to carry the name U.S.S> Enterprise, a 24th-century, Galaxy-class starship assigned to Deep Space exploration. Captain Picard (Patrick Stewart) was among the youngest Starfleet officers ever to command a starship. He appeared for seven seasons onin STAR TREK: THE NEXT GENERATION on television, and made his featuirefilm debut as Cpatain Picard in 1994. 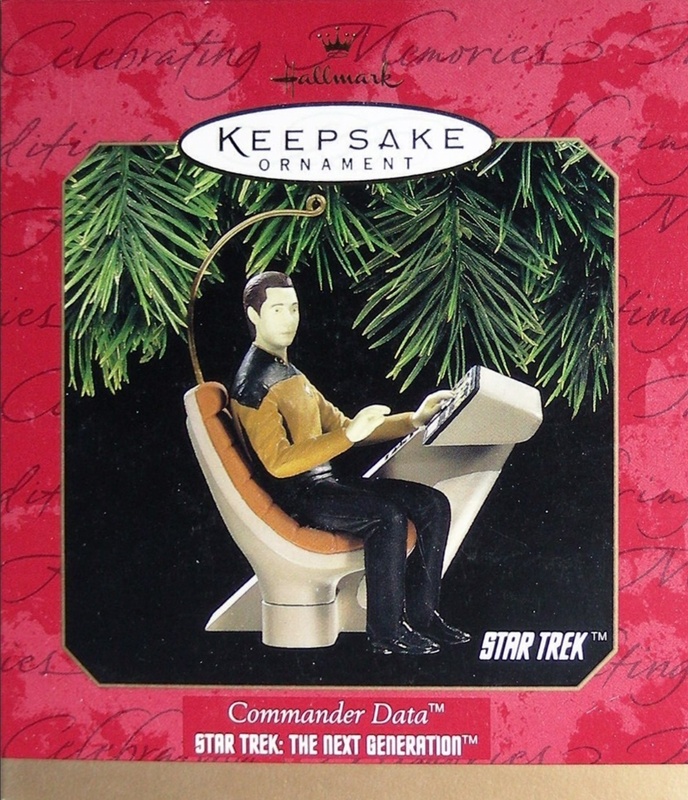 Look for Captain Picard’s counterpart, Captain James T. Krik from the original STAR TREK television series, in the 1995 Keepsake Ornament Collection at your Hall mmark retailer. This entry was posted in 007) 1995 Picard, 1995, Anita Marra Rogers, Characters, Master List, Picard, ST: TNG (TV) on October 20, 2011 by garfieldandtrump. Box Text: It’s the season of Peace! And here, arriving on a friendly mission, comes the “Romulan Warbird” from the television series, STAR TREK: THE NEXT GENERATION. 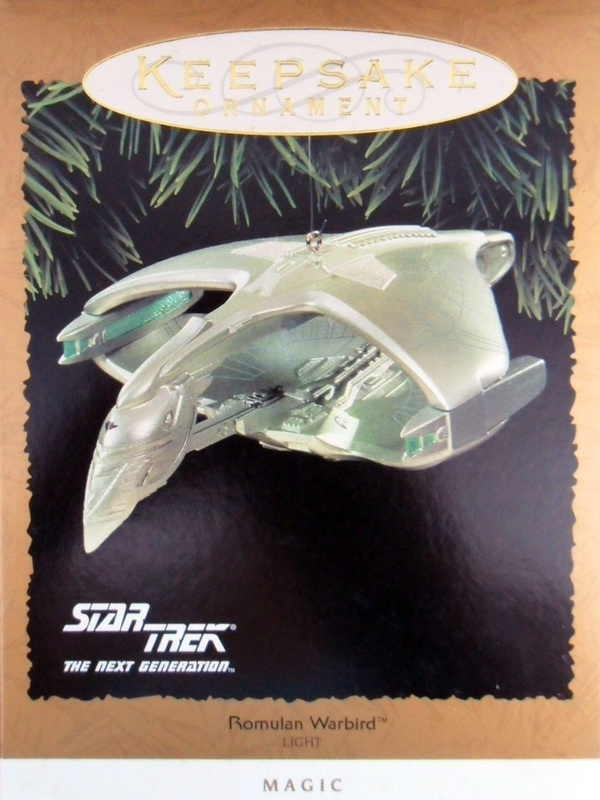 This intricately detailed starship with its glowing green lights will fill your holiday with Keepsake Magic! This entry was posted in 006) 1995 Warbird, 1995, Lynn Norton, Magic Light, Master List, Pigtail, Romulan Warbird, Ships, ST: TNG (TV) on October 20, 2011 by garfieldandtrump.